These yard signs supporting preservation of the historic Industrial Arts Building on the former state fairgrounds are popping up around Lincoln. Supporters of saving the Industrial Arts Building at the old state fairgrounds in Lincoln aren’t giving up their fight. In fact, they seem to be gaining momentum. 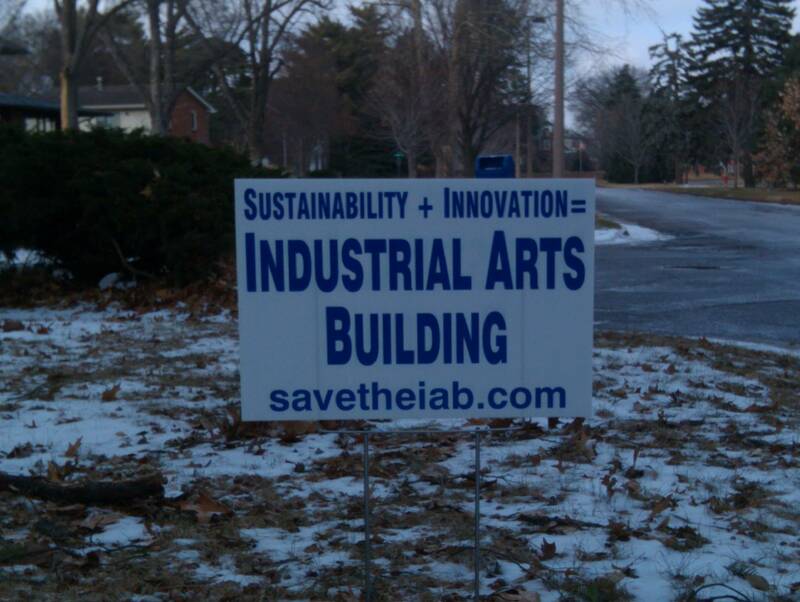 Have you seen their yard signs, which say “Sustainability + Innovation = Industrial Arts Building” with their website on the bottom? Apparently they started putting them up a few days ago, and I’ve already seen a few around town. They also have a website and 466 “friends” on Facebook, which says they will soon be adding a billboard around 12th and K streets. It’s like a genuine movement to preserve history — which I haven’t seen a lot of since moving to Lincoln six years ago. I was always surprised every time the City Council would consider a plan that would involve tearing down old buildings downtown and in the Haymarket, because nobody ever showed up to save them. Think about all the buildings that have been demolished in the Haymarket recently: those two buildings where WRK and UNL plan to build a hotel and Sheldon extension; the former antiques store where B&J plans another hotel; the old mattress factory which is now The Option. And farther east, downtown buildings have come down for what a project called Urban 38 — although those didn’t look historically significant, the ones slated for demolition now are quaint and historic. I can’t think of a single project that drew concern from anybody who thinks old buildings should be preserved. I figured Lincoln just didn’t have a strong historic preservation group — but that could be changing.